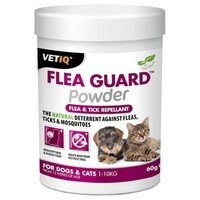 VetIQ Flea Guard Powder contains a unique blend of natural ingredients which will help to repel fleas and ticks on cats and dogs from 12 weeks of age. A superb natural deterrent for fleas and ticks, Flea Guard contains B-vitamins, yeast, zinc and garlic which help to make your pet’s blood less palatable without leaving any lasting chemicals on their skin or in their bloodstream. Flea Guard Powder also has the benefit of reducing the soggy doggy smells, whilst also keeping their coat glossy and skin healthy.